Many SLODOG members also enjoy training, working and trialing in the sport of stockdog. The thrill of watching your herding dog move stock is grand. There are a few locations to train in the area and several stockdog trials, workshops and activities throughout the year. 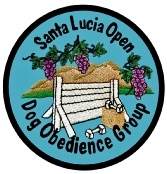 Even if your dog is not the herding type, you may want to attend and watch sometime. Working with a dog to hone his herding instincts has obvious practical livestock applications. But herding offers rewards to non ranch dogs as well. The focus and need to immediately respond to handler commands, and of course the sheer physically of it all produces a dog well-exercised in mind and body. A prospective Herding dog traditionally grew up in a working situation and was gradually introduced to and gained experience with livestock. This is the best way for a dog to learn to herd, but in our modern urbanized society it's not always possible. The trainer will be able to provide individual attention and instruction suited to you and your particular dog. Most trainers use stock and a facility that are suitable for all levels of experience. Lessons are often group style the trainer works with each dog-handler pair individually, then lets them take a rest while he/she moves on to the next pair. A handler can learn a great deal by observing the other training sessions, and the dogs not only enjoy the breather but most dogs also learn new things — whether herding or obedience or skills for helping the handicapped — best when schooled in a string of shorter sessions rather than a single monster attempt. Clinics can be helpful. They offer limited individual instruction but the exposure to dogs in various stages of training can be very educational. An organized herding instinct test is a common starting point. Instinct tests focus primarily on the beginning step of the first introduction of the dog to stock. Tests are held both at clinics and through individual trainers interested in having you and your dog as students. Some tests are open to all breeds while others, generally those sponsored by breed clubs, are breed-specific.